Barefoot Sound is proud to introduce our newest studio monitor, the MicroMain45. Featuring the same signal path, amplifier and driver technologies as our flagship MiniMain12, the MicroMain45 is stripped down to the bare essentials in order to deliver renowned Barefoot resolution and translation at a more affordable price. Prepare yourself for the next Barefoot revolution! Featuring the same signal path, amplifier and driver technologies as our flagship MiniMain12, the MicroMain45 is stripped down to the bare essentials in order to deliver renowned Barefoot resolution and translation at a more affordable price. The MicroMain45 is becoming another industry standard, with top producers, artists and studios like Alex Da Kid, Nathan Willett (Cold War Kids) and EastWest Studios using them everyday. As a 3-way active monitor, the Barefoot MicroMain45 utilizes the same amplifier, signal path and driver technology of the MiniMain12. Downsizing the hefty 130+ lbs size of the original to a tight 35+ lbs package, the MicroMain45 features an 8” aluminum woofer, two x 2.5” aluminum midranges and a 1” tweeter. With a bass response of -3dB @ 40Hz, frequency response of 40Hz – 45 kHz (±3dB) and 53Hz – 40kHz (±1dB), this is the sound that Barefoot enthusiasts have come to know and love. MEME™ Technology: Despite the advantages of high resolution monitors, Thomas Barefoot realizes that many engineers still use their NS10M’s † and mix cubes as secondary references. These speakers have long traditions and people find them familiar and useful for focusing in on certain aspects of their mix. However, crowding one’s console with those extra boxes degrades the sound field of the primary reference monitors. Not to mention, they are no longer manufactured, they need amplifiers, cable runs, and they consume more studio space. The solution is to make the MM45 sound and translate like those speakers. With the turn of a knob one can switch from the MicroMain45′s brutally revealing “Flat” response to the warmer and sweeter “Hi-Fi” setting, generically emulating the sound of some high end consumer audio gear. More specifically the “Old School” setting closely emulates the sound of the NS10M nearfield, while the “Cube” setting emulates the mid-centric sound of classic mix cubes The idea is not to perfectly replicate every subtle quirk of these venerable old speakers. That would be impossible. But the MM45 can capture the essence of how they behave and translate, modeling their frequency, phase and transient responses, dynamic compression and even specific distortion components. 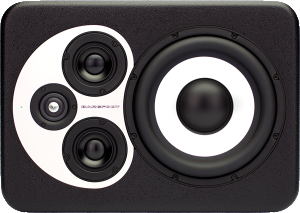 If you know how to work on these speakers you will feel very comfortable working on the new MM45′s emulation settings. Got MicroMain45 already ? – Upgrade to MicroStack45 ! Upgrade to the full sound of Barefoot Sound MicroStack45 by adding a pair of MicroSub45 in the mix.